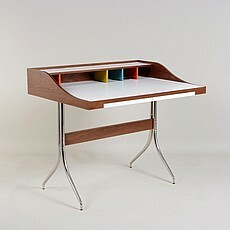 George Nelson was, together with Charles & Ray Eames, one of the founding fathers of American modernism. Nelson is sometimes thought of as "The Creator of Beautiful and Practical Things". 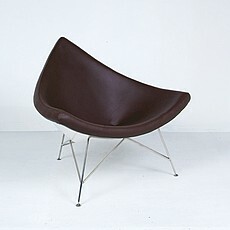 The best known George Nelson designs include the 1955 "Coconut Chair", with a triangular seat inspired by a piece of coconut shell. 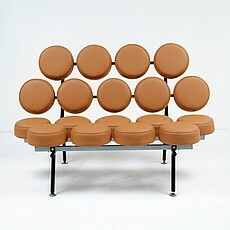 The 1956 "Marshmallow" sofa is another innovative George Nelson design, with a seat and back made of individual round cushions. We are happy to offer some of the highest quality reproductions available of these pieces. Dimensions (in): 42w x 32d x 36h; Seat Interior: 42w x 17d; Seat Height: 16.5h. 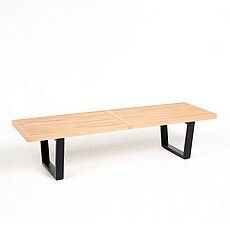 Dimensions (in): 48w x 20d x 16h; Seat Interior: 48w x 20d; Seat Height: 16h. 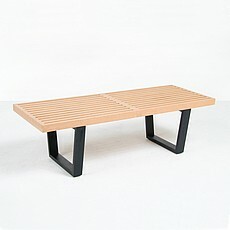 Dimensions (in): 60w x 20d x 16h; Seat Interior: 48w x 20d; Seat Height: 16h.